USA, 1940s These armchairs were manufactured by Shaw Walker in Michigan. 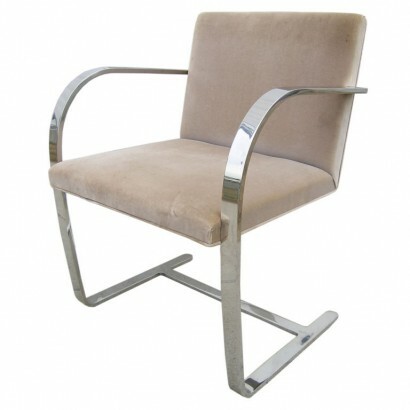 They feature an aluminum frame with wood arms, front legs, and back, as well as an upholstered leather seat. USA, 1950s Designed by Paul McCobb for Winchendon’s popular Planner Group line, these dining chairs feature clean lines with a sculpted back and tapered legs. USA, 1950s Russel Wright designed this solid maple chair for Conant Ball, inspired by round frame and spindles of the classic American Windsor. We have three available. Denmark, 1960s Designed in 1969 in collaboration with PP Møbler, the PP 203 chair is composed of an oak frame with an elegant rosewood inlay and a natural paper cord seat. Finland, 1990s Alvar Aalto designed this classic armchair in 1947 and it remains a sought-after example of his uniquely functional aesthetic. 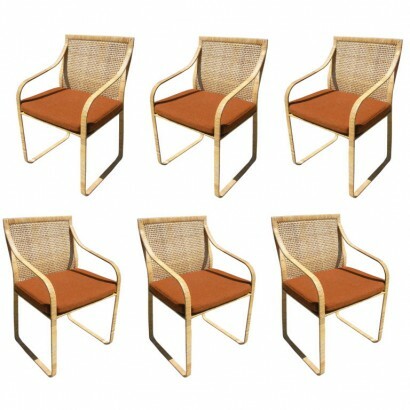 A solid laminated birch frame supports the white linen webbing that forms a durable but comfortable seat and back. 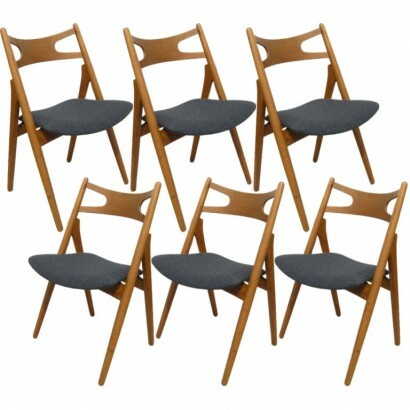 USA, 1950s Paul McCobb designed these eye-catching dining chairs as part of his Planner Group for Winchendon. Spindle backs and shovel-shaped seats in solid maple are held within an iron frame. USA, 1950s Each of these classic chairs has arms making a unique set. USA, 1950s This set of chairs was designed by Edward Wormley for Dunbar. 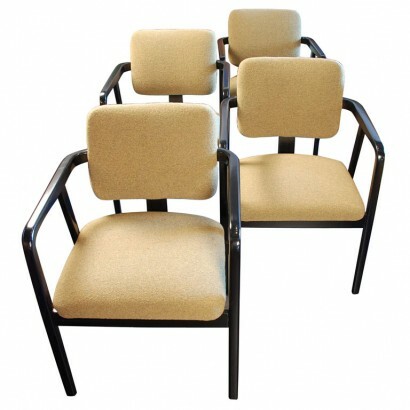 They are constructed of mahogany and feature upholstered seats and backs. 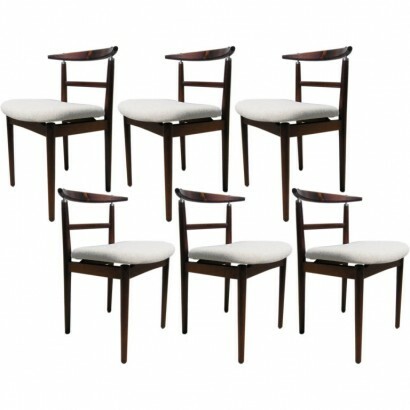 United States, 1950s Designed by John Widdicomb, this set of six dining chairs features solid mahogany frames with tapered backs and slender legs. The seats are upholstered in a rich moss green. Original label on underside. USA, 1950s Attributed to John Stuart at Widdicomb, these lovely walnut dining chairs feature rattan backs and have been reupholstered in soft white faux leather. This set comprises two armchairs and two side chairs. USA, 1950′s This set of two armchairs and six armless chairs has been reupholstered once, and the legs have been stained slightly darker. The textile is in excellent shape, so these chairs could either be professionally cleaned or reupholstered. 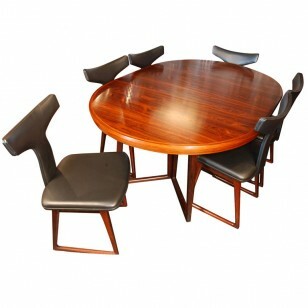 USA, 1950′s This unique octagonal dining table has a graceful arched design. This suite was featured in House Beautiful in May of 1956 as part of an article on the new era of Romanticism, which included quotes from T.H. Robsjohn-Gibbings. 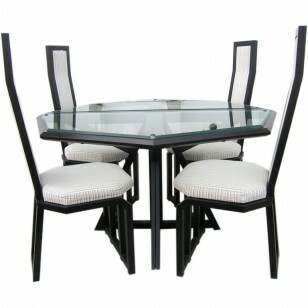 Shown with 60″ glass dining table by Pace with chrome and granite base. USA, 1950′s This beautiful dining set has been expertly refinished and the six chairs are newly reupholstered in Knoll textile. Marked with metal labels. The table has two 15″ leaves, which allow the length to extend from 60.25″ to 90.25″. 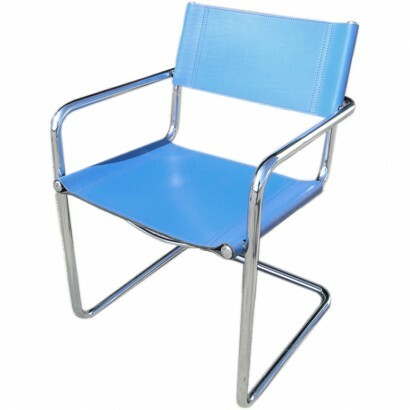 Italy, 1980′s Set of 10 tubular chrome and blue leather chairs by Matteo Grassi. 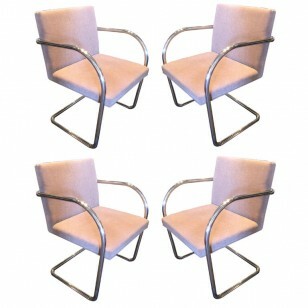 USA, 1980′s This set of ten Brno chairs have beautiful stainless steel frames which are in excellent condition. The textile needs to be replaced. Haiti, 1984 2 arm chairs and 4 armless chairs by Harvey Probber. Textile is in excellent condition. The armchairs measure 21″1/4W x 20″D x 35″H. 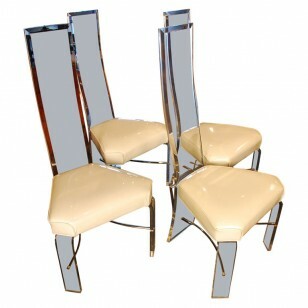 USA, 1970′s Elegant high-back dining chairs with hexagonal seats. 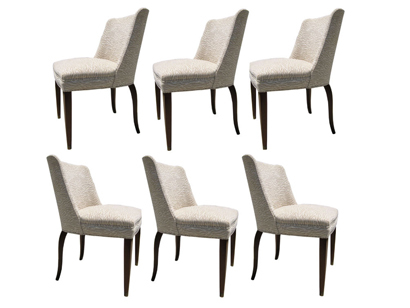 USA, 1950′s This set of six dining chairs by Edward Wormley are as comfortable as they are stylish. The upholstery is in very good condition. 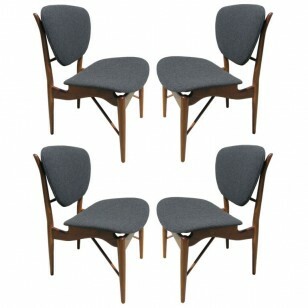 Denmark, 1950′s This set of four dining chairs by Finn Juhl have been expertly refinished and reupholstered with charcoal grey Maraham Hallingdal wool textile. The elegant shape and details showcase Juhl’s signature style.